Can’t decide between Nikon 1 J5 and Nikon 1 V3? Put your confusion aside, take some fresh air, and make yourself a cup of warm coffee, buddy! In the following article, we are going to discuss the key points of each of the two models! – Both models have an amazing continuous shooting speed of 60 fps! Yes, they can capture pictures at up to 60 fps rate. Snapping photos of fast-paced sports? No problem! You can get crystal-clear images with these models. – Both models also support time-lapse recording. 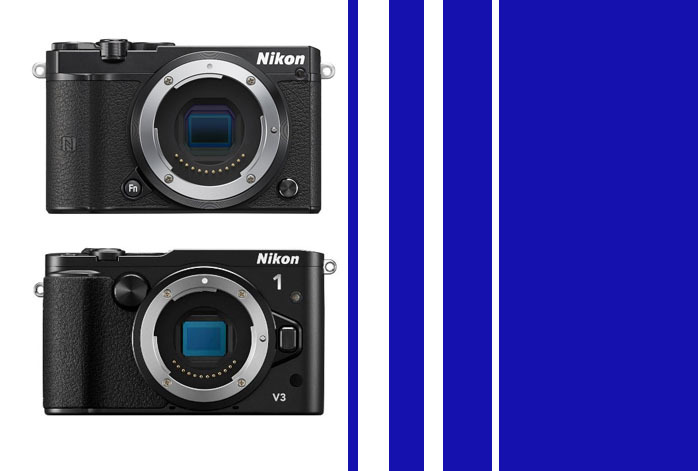 – Nikon 1 J5 and Nikon 1 V3 have identical display screens. Each of them has a 1037K dots resolution articulating screen, so, not only you can get extremely accurate image preview, but you can also have more flexible shooting positions. – Both of them have built-in flash. – Both of them have built-in Wi-Fi for easy and practical file transfer across various devices. – Nikon 1 V3 has a microphone port, while Nikon 1 J5 does not. If you are concerned about recording videos with high-quality audio, this is a strong point. – Nikon 1 V3 has an external flash shoe. Nikon 1 J5 does not. This is not exactly a deal-breaking feature, but certainly is handy when needed. – Nikon 1 V3 has a longer battery life than Nikon 1 J5. – Higher maximum resolution. With a 21 MP image sensor, Nikon 1 J5 can deliver much higher image quality than Nikon 1 V3. – Nikon 1 V3 can create Full HD 1080p videos, but Nikon 1 J5 can make 3840×2160 videos. The improvement is real here. Nikon 1 J5’s videos are much more detailed and sharper. – Nikon 1 J5 has better dynamic range and color depth than Nikon 1 V3. As the result, Nikon 1 J5’s images also have deeper and more accurate colors. Its images are more vivid and vibrant. – Significantly lighter. Despite having many improvements and upgrades, Nikon 1 J5 is actually more compact than Nikon 1 V3. The difference is around 150 grams. As the conclusion, Nikon 1 J5 has a lot more advantages than Nikon 1 V3, but this does not mean that Nikon 1 J5 is always the sure way to go. In general, you should choose Nikon 1 J5. But, if you prioritize high-quality audio, you should choose Nikon 1 V3 for the mic port.